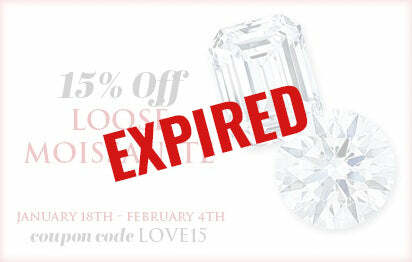 Home » Valentine's Day Jewelry Sale! 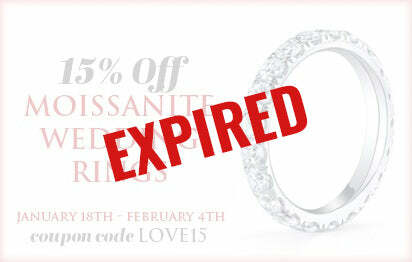 Treat your love to a beautiful piece of jewelry and make this Valentine's Day a day to remember. 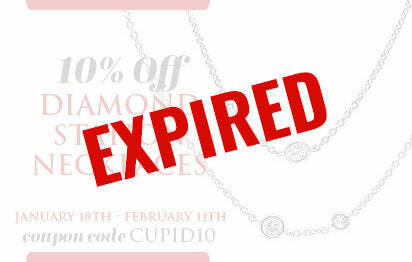 You don't need a valentine or to even know who St. Valentine was enjoy our Valentine's Day Jewelry Sale. On sale are four of our most popular sections - loose moissanite (perfect for the center stone of an engagement ring), moissanite wedding rings (our classic gold or platinum wedding rings set with moissanite), diamond station necklaces (for some sparkle around her neck) and gemstone station necklaces (for a sparkling accessory and a pop of color). Don't worry, we weren't going to leave you hanging there without some sort of explanation of "Who was Saint Valentine?" Saint Valentine was a 3rd century Roman bishop who was commemorated on February 14. Although very little is known about him in either the Catholic, Lutheran, Anglican and Eastern Orthodox churches, his legacy has been commemorating love since the High Middle Ages (approximately 1000-1250). For those checking their patron saint scorecards at home, St. Valentine is the patron saint of happy marriages, love, beekeeping and among other noble causes...he is also the patron saint against fainting. Who knew jewelry shopping could be fun and informative?